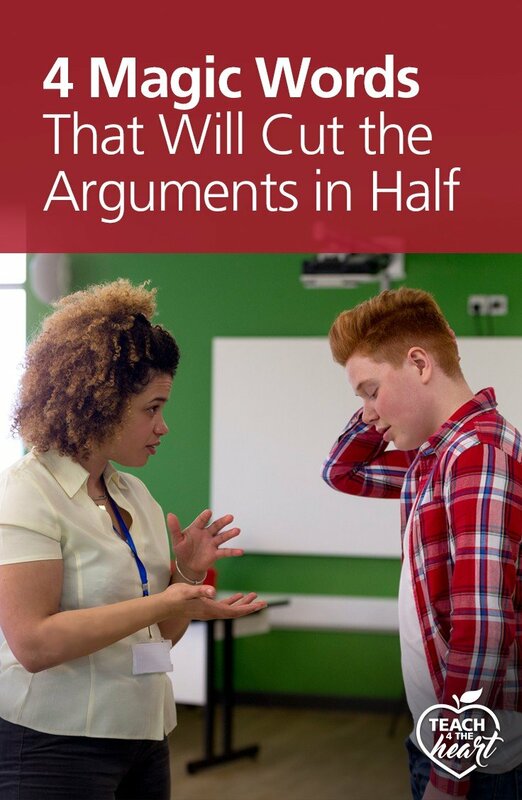 It was a great day when I discovered 4 magic words that just seem to dissolve tension and eliminate at least half of the arguments in my classroom. Students can be so defensive, can’t they? (and let’s be honest, we can be, too, right? But that’s another story.) Anyhow, we’ve all seen it happen. We try to correct a student – or even just give them some instruction, and they jump to the conclusion that we’re “yelling” at them or that they’re in trouble. But sometimes just saying those 4 simple words “you’re not in trouble” is all that’s needed to diffuse the situation and get everyone back on track. I used this phrase all the time when I was teaching, but I was reminded of its power just the other day when I was teaching 6th graders at church. This class has that one student whose goal is to cause as many disruptions as possible. And, of course, will correct you as the teacher when you ask him to be quiet but not the person behind him. You know the type. The start of class included many incidents of his being unnecessarily disruptive and my asking him to stop followed by some form of defensive response from him. And of course the defense was way more loud and boisterous than necessary so as to cause even more distractions. And the incredible result? No “why are you picking on me?” No “but Alex is talking too!” No, “but that’s not fair!” I might’ve had to put on my “I’m serious” face, but he got up and moved to the back without causing any more incidents. Point for the magic words. So the next time Camden gets all defensive when you’re trying to tell him to stop talking and get back to work, just say something like, “Camden, you’re not in trouble. I just need you to get back to work. Thanks.” And see what happens. I’m not saying it works 100% of the time, but I am telling you it will make a huge difference. Just be sure to couple it with a calm tone and pleasant disposition and wait for the magic to happen. Have you ever used the phrase, “you’re not in trouble” in your classroom? What else have you found helps ease your students’ tension? 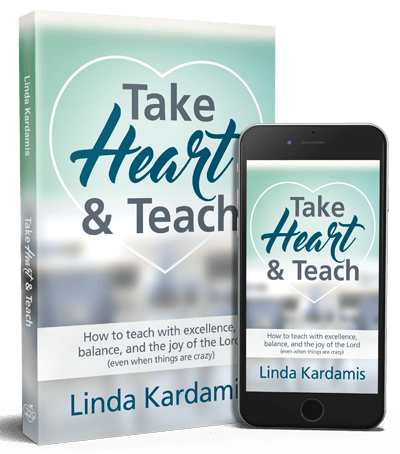 Grab our newest book Take Heart & Teach to unlock a plethora of practical tips and ideas that will help you teach with excellence, balance, and the joy of the Lord, even when things are crazy. I can totally vouch for this, Linda. Have seen it work myself! I love how you consistently zero in on situations we can all relate to. Thanks, I’ll try to remember to use those words! I can’t wait to use this in the fall! I had one very difficult class this school year, and all 14 habitually disruptive students voiced daily that I was “picking on” them personally! Then, I would get emails from their parents saying things like, “I know you hate my son, but is there something he can do to get his grade up?” It crushed me because loving and praying for my students and treating them fairly is what I feel I do well. I didn’t hate or even dislike any of my students, but by the end of the school year I was soooo discouraged and wondering if I even belonged in the teaching profession. This gives me hope for next year, especially if I have any of those students again. THANK YOU! These have always been my “magic words”: “You’re not in trouble”. I can’t begin to tell you how well these words work to relieve a students’ mind of defensiveness and keep open the lines of communication. I teach my students that the only way to get “in trouble” with me is to hurt someone or to destroy property intentionally, which happens so rarely, and even then, my kids know that it’s all about learning from our mistakes. I have done this before with a handful of my students and it always causes more disruptions. They take it as permission to run amuck and do as they please. I suppose it comes off as “if you are going to play then you may as long as you go to the back.” I think the phrase that works the best, but not always, has become “you may either snap to it or you will go and call a guardian and explain to them exactly why you are choosing your behavior right now.” We have some very headstrong young people.